Featured articles and reports by INSCT national security and counterterrorism experts, from the Journal of National Security Law & Policy, and elsewhere. The constructive conflict approach is presented in this book as a realistic perspective to understand the dynamics of all kinds of social conflicts, and thereby provide ways to improve the benefits and efficacy of Americans’ participation in foreign conflicts. This approach is an increasingly influential alternative to conventional adversarial thinking. Some elements of this approach are becoming increasingly adopted in many social arenas, or at least particular terms from it have become frequently used, such as “win-win,” “conflict transformation,” “stakeholders,” “mediation,” and “dialogue.” In order to assess the potential advantages and disadvantages of applying this approach, it must be set forth clearly. This dissertation is an in-depth case study of NATO advisors and their perceived influence in Afghanistan (2009-2012). It explores the two-part question, how do foreign security actors (ministerial advisors and security force trainers, advisors, and commanders) attempt to influence their host-nation partners and what are their perceptions of these approaches on changes in local capacity, values, and security governance norms? I argue that security sector reform (SSR) programs in fragile states lack an explicit theory of change that specifies how reform occurs. From this view, I theorize internationally led SSR as “guided institutional transfer,” grounded in rationalist and social constructivist explanations of convergence, diffusion, and socialization processes. Responding to calls for greater depth and emphasis on interactions and institutional change in SSR research, I examine NATO’s efforts in Afghanistan as an extreme case of SSR in which external-internal interactions were the highest. A stratified, purposive sample of 68 military and civilian elites (24 ministerial advisors, 27 embedded field advisors and commanders, and 17 experts and external observers) participated in a confidential, semi-structured interview. Events surrounding the European Union’s (EU) Eastern Partnership Summit in Vilnius, Lithuania in late November 2013 foreshadow what Eurasian states will experience in the coming decade. Ukraine’s pivot back to the east, coupled with Moldova, Georgia and others always looking over their shoulder and Armenia’s abrupt end in considering the EU Association Agreement, begs the question: what key geostrategic factors are motivating these outcomes?Addressing this question – and its related contexts and causes – depends upon understanding the contemporary geostrategic reality facing Eurasia, and importantly, Russia’s and other influential players’ emerging political calculus. This paper will define Russia’s strategic window of opportunity by first providing strategic-level analysis of the difficult choices facing the most influential actors for the region – the United States’ (U.S.) strategic rebalance toward the Asia-Pacific, the European Union’s (EU) inward orientation, a weakened North Atlantic Treaty Organization (NATO), and ultimately, Russia’s own strategic ascent. The paper will then argue that a revived Russia will seize an opportunity to reestablish its sphere of influence in Eurasia over the coming decade. 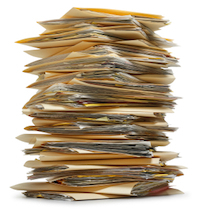 This article examines the controversy surrounding bulk telephone metadata collection that has ensued since their disclosure in June 2013. The author analyzes the “use of tangible things” provision to acquire telephony metadata, including limitations on this practice, the statutory issues such a practice raises, and the ways in which the Foreign Intelligence Surveillance Court has decided on the issue since 2006. This article concludes that the Executive’s response, as delineated in a January 2014 speech, has yet to be fully implemented; however, the author argues that the disclosures have nonetheless raised new questions about the relative values of privacy and transparency in US intelligence. The provision of lethal aid to the Syrian rebels appears questionable from a purely legal perspective. It would arguably amount to a use of force. Neither of the traditional legal justifcations for the use of force—self-defense and authorization by the Security Council—applies in this case. While humanitarian intervention arguably offers a (weak) basis for the use of force, states would be wise to hesitate before embracing a liberal right to humanitarian intervention, because such operations can serve as convenient subterfuges for armed intervention. According to Kant, “some confidence in the character of the enemy must remain even in the midst of war, as otherwise no peace could be concluded and the hostilities would degenerate into a war of extermination.” In other words, accepting the inevitability of war, following a code of conduct during armed conflict distinguishes legitimate from illegitimate warfare. Remarkably, Kant envisioned the heart of the modern laws of war, or jus en bello, now codified in the Geneva Conventions and their Protocols and further reflected in customary law. At the same time, neither Kant nor the authors of the Geneva Conventions envisioned how contemporary means and actors in armed conflicts have threatened the central efficacy of the normative framework for lawful combat. This brief essay suggests how the ideas embedded in Kant’s Preliminary Article 6 might be embellished to accommodate some verities of our contemporary world. Beginning in 1978, the Foreign Intelligence Surveillance Act (FISA) authorized the means for electronic collection of foreign intelligence that served the nation well for many years. 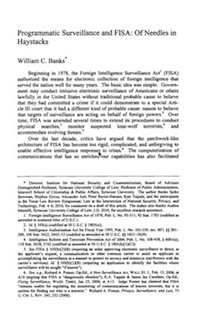 In Part I and Part II of this article, INSCT Director William C. Banks reviews the FISA model for authorizing surveillance for foreign intelligence purposes and how the combination of evolving technologies and emerging terrorism threats caused FISA to become too unwieldy and inflexible to accommodate the needs for speedy and agile surveillance. In Part III, Banks describe how the Bush Administration’s Terrorist Surveillance Program (TSP) led to the temporary Protect America Act (PAA), and then to the FAA and the codification of programmatic surveillance. After reviewing a FISCR decision upholding the temporary version of programmatic FISA procedures and taking note of some implementation problems with the FAA in Part IV, in Part V Banks suggests some benchmarks for rebuilding FISA from the ground up. One of the major themes of the Cyberspace Policy Review is that a national strategy on cybersecurity must be consistent with the protection of privacy rights and civil liberties guaranteed by the Constitution and the law. Indeed, President Obama underscored that point in announcing the Review when he said that his Administration “will preserve and protect the personal privacy and civil liberties that we cherish as Americans,” reiterating the theme from his inaugural address that choosing between our safety and our ideals is a false choice. The authors of the Review are to be commended for encouraging a national dialogue on how this can be achieved while promoting national and economic security. 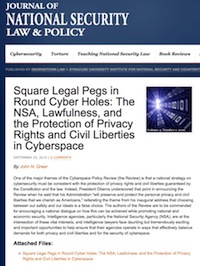 Intelligence agencies, particularly the National Security Agency (NSA), are at the intersection of these vital interests, and intelligence lawyers face daunting but tremendously exciting and important opportunities to help ensure that their agencies operate in ways that effectively balance demands for both privacy and civil liberties and for the security of cyberspace.